Part of the subtle art of Unschooling is finding ways to inspire your children and to help them find their interests. As a result, part of the ongoing process of Unschooling is exposing children to new ideas, topics and pursuits, but also to model a lifestyle of pursuing interests and hobbies. When children see their parents learning even as adults, it has a couple of important effects. First, it impresses upon them the idea that you never stop learning. There’s always something new to explore, as well as knowledge and skills to gain. Since this idea is the basic foundation of Unschooling, it’s important for them to see it in action, and what better place to observe it than in their parents, with whom they interact constantly. Second, by watching their parents interests and hobbies, there’s a decent chance that they will be inspired to pursue some of those same hobbies. Even if they don’t, they will be at least be exposed to some of the many options that fill the world around them. Over the past few years, in order to pursue this ideal in our home, I’ve made a concerted effort to pursue my own interests more intentionally. I took up playing the clarinet once again and joined a local concert band. The kids see me practice regularly and love to attend my concerts. Although none of them are interested in playing the same instrument, they’re all more engaged and interested in music than they were before. Their favorite instruments vary, but they want to learn them in their own ways. My oldest son saved up his allowance until he was able to buy an electric guitar and is angling for lessons so that he can learn to play it properly, while his younger brother is saving up for a drum set. This is what a typical morning looks like. I’ve also started playing chess more competitively. I’ve always loved chess, so much that I started a chess club in my High School, which previously lacked one, but hadn’t played much in tournaments. Over the past year I decided to change that, and have been studying and playing in tournaments. 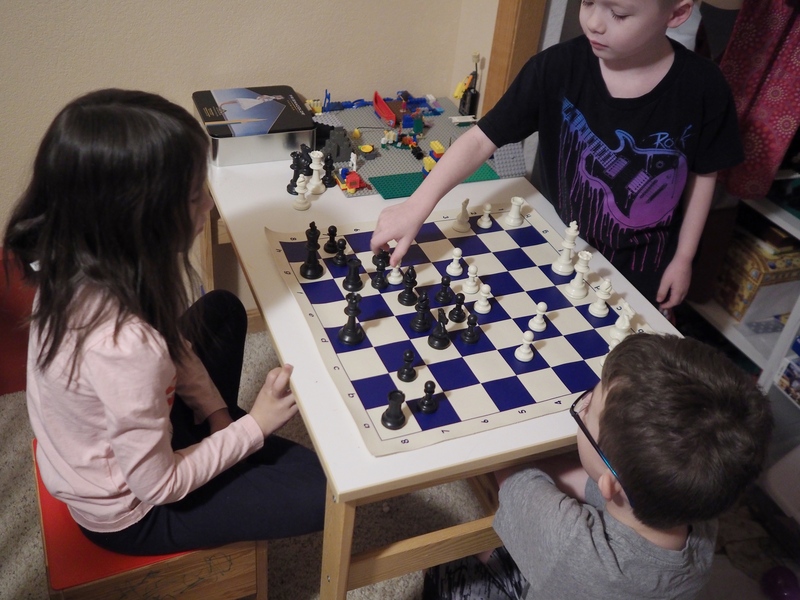 Besides the fact that I really enjoy it, my older kids have become more interested in chess than they were before. Watching me play a game on my phone, occasionally they asked questions about it and asked to learn. Even as I’ve begun playing more frequently and seriously, they’ve become more passionate about the game as well. They play first thing almost every morning, they watch instructional videos in a chess app. They also attending a local homeschool chess club. In the process they’re getting much better and developing a lot of confidence in their abilities. At times they’ve asked Mrs. Hatter, their mother, if they could teach her to play chess. Since she’s not at all interested in the game, it’s been an opportunity to show them the value of not pursuing things that hold no interest for us. We have a limited amount of time each day, and it’s important to prioritize how we spend our time. Just because someone else values an activity does not mean that everyone else needs to agree and pursue it. Choosing what not to do can be just as important as what we choose to pursue. These are small examples in the big scheme of Unschooling, and I could add many more, but they all demonstrate an important principle: parents should inspire their children by modeling how to learn and explore interests. At the same time, they have the freedom to choose their own interests and not necessarily follow in the footsteps of their parents. When our paths diverge, the examples we set by showing them our passions can help them figure out how to immerse themselves in their own pursuits. The more they see this ideal in action, the easier it is for them to internalize it and put it into effect in their own lives. And when they do, the results are amazing. We’re finding the same thing with my kids. They all have such diverse interests (aside from Minecraft). It’s the wonderful thing about having them home. They can explore a whole lot more that way. I made the same realisation this year! I’d spent the first few years of motherhood giving up my hobbies as I felt selfish taking that ‘me time’. I’ve only recently taken up yoga again and getting back out on my bike. My eldest boy is so into fossils right now – such a joy to watch him fossil hunting, chipping rock, cleaning, polishing….